Preheat the oven to 180°C/gas mark 4. Grease and line 3 x 18cm round cake tins with baking parchment. Using an electric hand whisk, beat the butter and caster sugar together in a large bowl until light and fluffy. Add the eggs, one at a time, beating well after each addition. Sift in the flour,baking powder and salt and fold through evenly with a large spoon. Stir in the vanilla extract and milk until combined, then fold in the sprinkles until evenly dispersed. Divide the mixture between the prepared tins, spreading evenly. Bake for 20 minutes, or until a skewer inserted into the centre comes out clean. Leave to cool in the tins for 5 minutes, then turn out onto a wire rack and leave to cool completely. Meanwhile, for the buttercream, beat the butter, icing sugar and vanilla extract together in a bowl until light and fluffy. Once the cake layers are cold, sandwich them together with some of the buttercream, then coat the cake completely with the remaining buttercream. Chill in the fridge for 1 hour. To decorate, pour the rainbow sprinkles into a large baking tray. Carefully lift the cake and roll it through the sprinkles, pressing them into the buttercream and using your hands to gently press them into the top of the cake. Slice and serve. 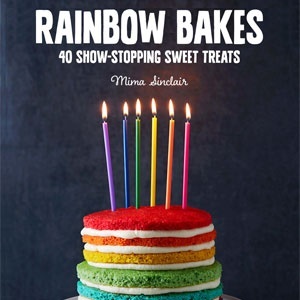 Extract from Rainbow Bakes by Mima Sinclair. Published by Kyle Books and distributed by Jonathan Ball Publishers. Available in all good book stores.